Last night we ate dinner at Dom’s, a shack up the beach with great food. We watched the sun go down….a gigantic orange ball. Then we walked a mile and a half on the dark beach back to our room at the Leela Kepinski Hotel. (Yes, Scott walked that far! )This morning we got up early to catch the same huge orange ball rise up over the palm trees. Consequently, we were the first to arrive at the fabulous buffet breakfast. Well, maybe not the first. A murder of crows were lying in wait for us. They are protected here along with the more exotic birds like kingfishers, kites, and egrets so they are brazen when it comes to swooping down onto the outdoor tables at the cafe to carry away the croissants. I didn’t see it but I heard a loud yelp as Scott was buzz bombed by a crow who diverted his attention via diving for his glass of OJ when the real target was a plate of shaved ham and other goodies he was carrying in his other hand. A guard usually stands by with a rifle–no kidding– to scare off the crows. 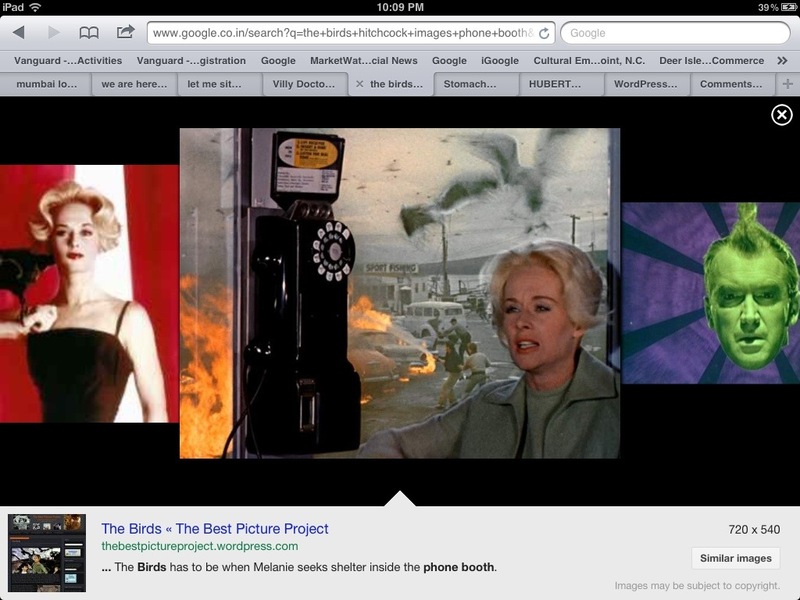 But we were early and we were on our own, much like Tippi Hedren in the telephone booth! This entry was posted in Uncategorized and tagged crows, Going to Goa Blog, leela kepinski hotel goa, Scott Morgan. Bookmark the permalink.